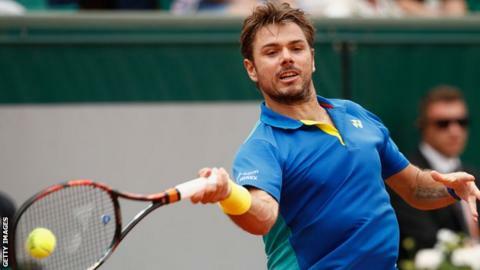 Third seeds Stan Wawrinka and Simona Halep both beat Slovakian players to reach the French Open second round. Romania's Halep was a doubt for the tournament after tearing an ankle ligament less than two weeks ago, but thrashed Jana Cepelova 6-2 6-3. Switzerland's former champion Wawrinka overcame world number 152 Jozef Kovalik 6-2 7-6 (8-6) 6-3. Juan Martin del Potro, in his first match at Roland Garros since 2012, beat fellow Argentine Guido Pella. The former US Open champion, a potential third-round opponent for Andy Murray, has had a number of injuries in recent years but impressed with a 6-2 6-1 6-4 victory. Home favourite Gael Monfils, seeded 15th, beat Germany's Dustin Brown 6-4 7-5 6-0 in a match between two of the game's most entertaining players. Japanese eighth seed Kei Nishikori, who had a wrist injury going into the tournament, beat injury-plagued Australian Thanasi Kokkinakis 4-6 6-1 6-4 6-4, while Australian 18th seed Nick Kyrgios also progressed by beating Germany's Philipp Kohlschreiber 6-3 7-6 (7-4) 6-3. But German ninth seed Alexander Zverev is out after losing 6-4 3-6 6-4 6-2 to Spain's Fernando Verdasco. The 20-year-old was fancied for a strong performance in the tournament as only one of two players - the other being Spaniard Rafael Nadal - to win multiple clay-court titles this season. Slovakia's Martin Klizan will face world number one Andy Murray in the second round after a bad-tempered win over France's Laurent Lokoli. Frenchman Lokoli was unhappy with an ecstatic reaction from Klizan to his double fault, accusing him of lacking respect and then refusing to shake hands with him at the end of his five-set defeat. In the women's draw, Ukrainian fifth seed Elina Svitolina went through 6-4 6-3 against Kazakhstan's Yaroslava Shvedova and Polish ninth seed Agnieszka Radwanska won 6-1 6-1 against France's Fiona Ferro. In the men's doubles, Britain's Jamie Murray and his Brazilian partner Bruno Soares - who won both the Australian Open and US Open titles last year - eased past Serbia pair Janko Tipsarevic and Viktor Troicki 6-3 7-6 (7-0) in their first-round match.